We are especially pleased to post this essay by a long-time supporter of the UT Austin Department of History. Josiah M. Daniel III, of counsel at the international law firm Vinson & Elkins, LLP, received his J.D. from The University of Texas School of Law in 1978 and his master’s degree in History from UT in 1986. In 2011, Mr. Daniel was elected to membership in the prestigious American Law Institute. He is an inaugural member and former Chair of the UT History Department Visiting Committee. Working this month in historical archives and observing the news of the April 10, 2017 appointment of Neil Gorsuch to replace Justice Antonin Scalia, who died in 2016, have reconfirmed for me that history (if known) can illuminate current events. The Supreme Court Building (via Wikimedia Commons). Presidents are attuned to the age and health of each serving justice in anticipation of vacancy, whether by death, resignation, or retirement. On the other side, the decision of any justice of advancing years to leave office, rather than to serve until death, has often been a difficult personal choice. For the past 80 years, that decision of aging justices has been eased by an enactment sponsored by a Dallas congressman, Hatton W. Sumners (1875-1962). 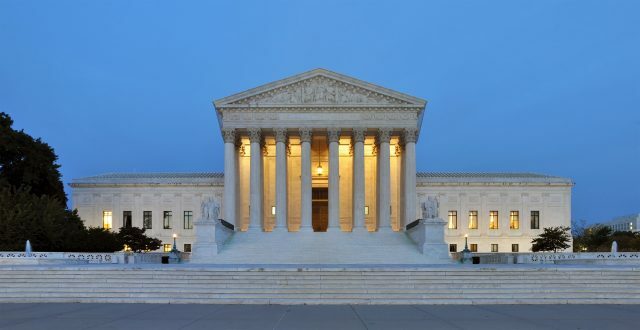 Sumners’ statute, the 1937 Retirement Act, guarantees undiminished lifetime salaries to retiring justices and it authorizes them to continue in the adjudication of federal cases in the lower courts, if desired. Sumners had been appalled when, early in the Great Depression, Justice Oliver Wendell Holmes, aged 90, resigned after thirty years’ service and had his pension immediately halved in a penny-pinching measure. The Retirement Act prevented that situation but is also noteworthy because of its role in the “court-packing crisis” of 1937. Sumners’ definitive biography remains unwritten, but he was a significant Congressman over four decades of the 20th century. In 1894 Sumners moved from Tennessee to Texas and quickly became a lawyer. In 1912 he won the at-large seat for the U.S. House of Representatives and two years later he won a seat in Dallas’ Fifth Congressional District, which he held until 1946. His papers reside in the archive of the Dallas Historical Society, where I have been reviewing them. Congressman Hatton W. Sumners in 1938 (via Wikimedia Commons). Sumners was devoted to his work and old fashioned in dress and speech. One woman who lobbied him in the late 1930s described him as “the epitome of the Southern conservative [who] even wore a frock coat. . . . a relic of the past.” From 1932 until he left office, Sumners chaired the House’s Judiciary Committee, a position he used, among other things, to block anti-lynching legislation based on his spurious and degrading view of African Americans. This did not prevent President William Howard Taft from calling him “the best lawyer in Congress,” or a 1939 LIFE magazine poll rating him most highly for integrity among all Congressmen (a video clip of Sumners speaking in 1937 can be found here). Roosevelt’s first term, from 1933 to 1937, generated a surge of innovative legislation, commonly known as the “New Deal,” that tackled the deep economic and social problems of the Great Depression with innovations such as Social Security, relief for the poor and unemployed, reform of the financial system, and economic recovery. A scene of destitution during the Great Depression (via Wikimedia Commons). But virtually all of those new federal laws were challenged in the federal courts on constitutional grounds including the argument that the legislation violated “substantive due process,” the predominant constitutional theory typified by the famous Lochner v. New York decision of 1905 that generally vindicated private-property rights over other interests and policies. On the Supreme Court, the “Four Horsemen,” Justices Willis Van Devanter, Pierce Butler, James Clark McReynolds, and George Sutherland, were committed to that doctrine; and, at the start of the series of overturnings of New Deal enactments in 1935 and 1936, their ages ranged from 69 to 76 (at the time, male life expectancy was 60). The newest justice, Owen Roberts, appointed by President Herbert Hoover in his final year in office, joined them frequently for the 5-4 majority in those cases. FDR was outraged and after winning reelection by a landslide in November 1936, the President announced his so-called “court-packing plan” to overcome this roadblock to his legislative agenda by increasing the Supreme Court’s membership from nine to a maximum of fifteen if justices reaching the age of 70 declined to retire. 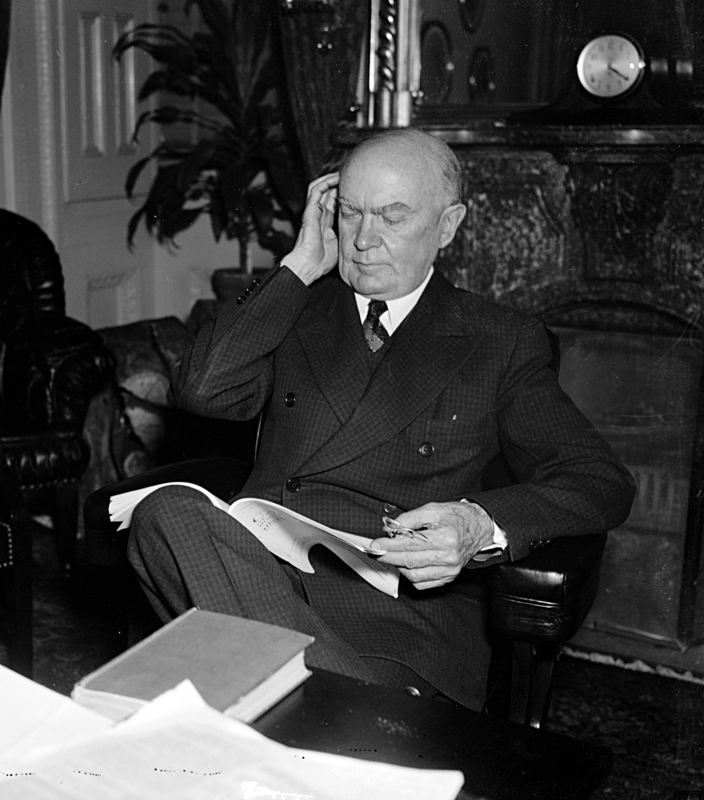 Sumners had joined the New Deal legislative team when Roosevelt took office in 1933, but he was more conservative than the President, often seeking to steer a middle-of-the-road course on the various issues of FDR’s legislative program. 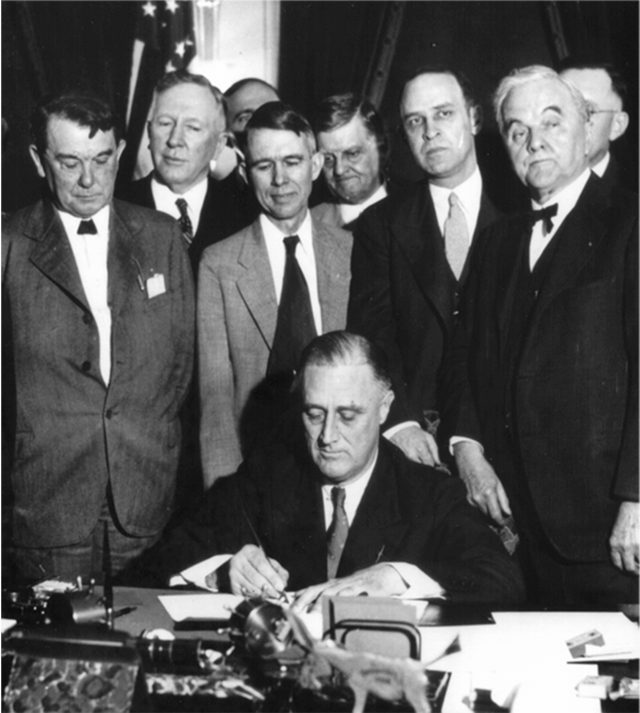 ‎President Roosevelt signing New Deal legislation, 1933 (via Wikimedia Commons). After a preview of the court-packing plan at the White House on February 5, 1937, Sumners made a pithy comment that was misquoted, then and subsequently, as “Boys, here’s where I cash in my chips,” interpreted to mean he was departing the FDR team because he disagreed with its tactics. That last reference was to Sumners’ efforts, prior to Roosevelt’s unveiling of the court packing plan, to accomplish the President’s desired result—the addition of new, more progressive members to the Supreme Court—by other paths. 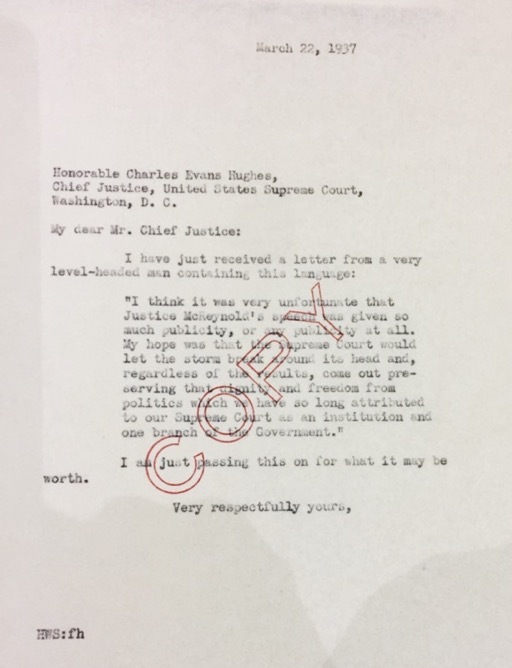 On one hand, he was close to and in communication with Van Devanter and the Chief Justice, Charles Evan Hughes, urging calm and patience about the court-packing plan. Sumners to Charles Evans Hughes, March 22, 1937 (Sumners Papers, Dallas Historical Society, via author). Justices of the Supreme Court are hereby granted the same rights and privileges with regard to retiring, instead of resigning, granted to [all other federal] judges . . ., and the President shall be authorized to appoint a successor to any such Justice of the Supreme Court so retiring from regular active service on the bench, but such Justice . . . so retired may nevertheless be . . . authorized to perform such judicial duties, in any judicial circuit . . . as such retired Justice may be willing to undertake. Sumners’ bill sailed through Congress, and on March 1, 1937, the President signed it into law. H.R. 2518, enacted as Public Law No. 10, codified at 28 U.S.C. § 375 (via Legisworks). The court-packing plan was defeated in the Senate, 70-20, on July 22. Most historians credit the defeat, not to Sumners’ Retirement Act, but to the “Switch in Time that Saved Nine.” That is, the youngest justice on the court, Owen Roberts, who had been voting with the Four Horsemen in those 5-4 reversals of first-term New Deal programs, suddenly voted to sustain the constitutionality of the minimum wage law in a decision issued by the Court on March 29, 1937. Commentators have noted, for instance, that Roberts cast his vote in that case before the advent of the court-packing plan, and some have perceived a jurisprudential shift already underway. But the most recent scholarship substantially credits Sumners, who obtained an initial draft of the Retirement Act from FDR’s team, for pushing it through quickly, which did in fact induce several rather quick retirements. These retirements gave Roosevelt vacancies to fill, assuring the survival of New Deal legislation and enabling FDR to shape the Court for a long time. 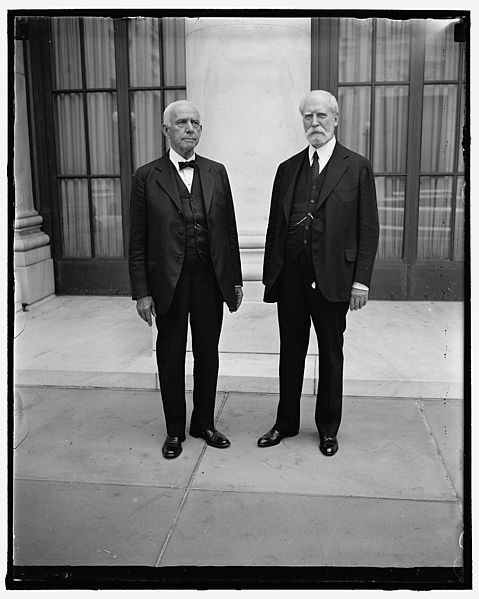 Justice Van Devanter on his last day before retirement, with Chief Justice Charles Evans Hughes (via Wikimedia Commons). First, Justice Van Devanter took advantage of Sumners’ enactment and retired on June 2, 1937 at age 78, which vacancy FDR filled with one of most consequential justices of the twentieth century, Justice Hugo Black. Then Justice Sutherland retired on January 17 the next year, replaced by Justice Stanley Reed. In the decades since, only five justices have resigned, most recently Abe Fortas in 1969, but 24 have retired with the benefits of the Retirement Act. Some retired justices have elected to continue to adjudicate cases. Justice Tom Clark sat, after his 1967 retirement, in the lower courts for ten years, and more recently Justice Sandra Day O’Connor, who retired in 2006, has joined judicial panels deciding scores of cases in the Courts of Appeal in almost all federal circuits. Today, two sitting justices are in their 80s, and one is 78. Will the Retirement Act encourage any of them to retire and provide an additional appointment opportunity for the current administration? History Calling: LBJ and Thurgood Marshall on the Telephone, by Augusta Dell’Omo. Could a Supreme Court Justice be President?, by Lewis Gould. George on the Lege, a nine-part series on the Texas legislature, by George S. Christian.